South Yarra is a residential suburb extending from St. Kilda Road to Williams Road, Toorak, bordered on the north by the Domain, the Botanic Gardens and the Yarra River, and on the south by Commercial Road, Prahran. Its prestige as a residential address approaches that of Toorak. Its railway station, 3 km. from Melbourne, is about in the middle of South Yarra. The western part of South Yarra is in Melbourne city and the other in Stonnington (previously Prahran) city. That has been a cause for the western part wanting to secede from Melbourne at various times. 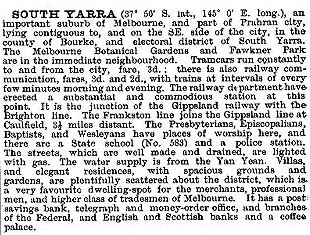 South Yarra was the location of the first of three Crown land sales for Prahran, the subdivisions beginning south of the Yarra river in 1840s and ending at Dandenong Road ten years later. A purchaser in 1840 was Lieut.-Colonel Charles Forrest. He built two residences on Forrest Hill, the most northerly becoming the site of the Melbourne Boys’ High School. Local clay supplied the bricks, and later became the site of the South Yarra brickworks. West of Punt Road in 1846 the former Norfolk Island Commandant Lieut.-Colonel Joseph Anderson acquired the choice site of the South Yarra Hill which overlooked the St. Kilda Road track which straggled through lower-lying sandy and swampy terrain. Anderson Street is named after him. Access to South Yarra was by boat or punt – hence Punt Road – until Princes Bridge was opened in 1850. Shortly before the 1846 land sale the site for the Botanic Gardens was reserved. The western part of South Yarra thereby achieved the dual advantages of elevation and a first-class pleasure ground. The erection of the new Government House in part of the reservation in 1879 added to South Yarra’s desirability. A good many original homes of South Yarra west (c.1860-1900) survive, although some have been removed for the building of flats. The sites were smaller than those in Toorak and less prone to subdivision of the grounds or internal subdivision of the houses into flats. In addition to the Botanic Gardens there is Fawkner Park, reserved in 1862 but abbreviated by the development of the strip fronting St. Kilda Road. The allotments, however, were large, attracting correspondingly large residences to take advantage of the St. Kilda Road boulevard. In the postwar years they became the site of the southway extension of the central business area. The major institutional buildings are the primary school (1877) on the site of a Presbyterian church school (1854), Christ Church at the prominent corner of Punt and Toorak Roads (1857), and Melbourne Grammar School (1858) on a site chosen in 1854 when the school at St. Peter’s Hill, East Melbourne, looked to its future. South Yarra east of Punt Road was connected to Melbourne by railway in 1859, and joined to Caulfield and Gippsland in 1879. The two commercial spines are Chapel Street and Toorak Road, and their intersection had business premises by the mid 1850s. In 1880 a cable tram engine house was built at the corner, later to become the Capitol Bakeries building (1928) and then a retail and entertainment venue (1988). The most notable grand residence is Como built between 1847 and 1855 with grounds extending to Toorak Road. The grounds were subdivided in 1911, but the house preserved and taken over by the National Trust in 1959. Elsewhere in the northern area of South Yarra the desire for a good address stimulated the building of flats along Alexandra Avenue, particularly during the 1930s. Compared with the later high-rise blocks their designs are ornate. The northern section of Chapel Street (Forrest Hill) was industrial, with the Hecla/Electrolux factory (1922) and the brickworks. They become the site of the Como shopping and apartments projects, beginning in the 1980s and unfinished a decade later. The Melbourne Boys’ high school on the other side of Chapel Street was built in 1927, the successor to a co-educational State continuation school originally in East Melbourne. Southwards in Chapel Street the Victoria Preserving Company began operations in 1874 in the building which came to be known as the Jam Factory. It was operated until 1970 by I.X.L. (Henry Jones), becoming a shopping complex in 1979. Although Chapel Street is generally known as being in Prahran, the part north of Commercial Road (which includes the Prahran Market and the Horace Petty housing estate) is in South Yarra’s postcode area. Hawksburn is also in South Yarra. Whereas the grand churches are west of Punt Road and eastwards in Toorak, the Catholic St. Josephs church (1888), school and community centre is behind Chapel Street, in Fitzgerald Street. Nearby the evangelical Church of Christ was opened in 1908 in unpretentious premises. South Yarra, like Prahran, was caught in the predicament of higher-density postwar housing in the form of flats. The Prahran council arrested the population decline with Housing Commission high-rise flats, but with considerable public resentment. The resentment became strong opposition in the 1970s when developers persuaded the Council to permit high-rise private developments generally throughout the municipality. The South Yarra Anti-High Rise Group secured restraints on the building heights. Toorak Road, South Yarra, has a strong shopping strip, with emphasis on fashion, dining out and entertainment. Its viability has been maintained by the creation of rear car-parking lots during the 1980s and 1990s. South Yarra has numerous places and buildings on historic building registers. The Royal Botanic Gardens, Government House, the former Melbourne Observatory and La Trobe’s cottage (all in the Domain area), are on the Victorian Heritage Register. Melbourne High School (1928), Melbourne Church of England Grammar School (1856), Christ Church and six residences area also on the Register. Between 1987 and 1996 the median house price in South Yarra was about 92% above the median for metropolitan Melbourne. Malone, Betty and Slater, L. Oscar, “Walking Tour of South Yarra Central”, Prendergarst Publishing, 1988. Slater, L. Oscar, “Walking Tour of South Yarra West”, Prendergarst Publishing, 1987.